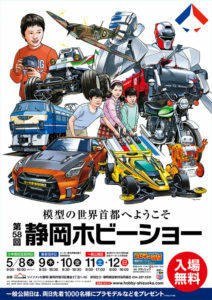 The 58th Shizuoka Hobby Show promises to be a massive festival of hobby-related fun, and Tamiya’s booth will once again be the focus of attention with the display of new and recent releases in each genre. Get down to the Twin Messe venue and take a look at the new products, taking the chance to speak to Tamiya staff, as well as doing some shopping in the sales corner. The popular Tamiya Open House event will be held on the Saturday and Sunday at the Tamiya HQ, making it a packed 2 days of hobby-related fun! This entry was posted in Event Report on April 4, 2019 by admin.